Justice League Dark tries to cram far too much into its relatively short 70-odd minute runtime—and because of it, not everything it does quite sticks the landing. What does, though, is remind us that Matt Ryan’s excellent John Constantine has been a dearly missed character in our lives since his TV show got canceled. Justice League Dark—which was released digitally late last month, ahead of a physical release this week—carries a lot on its shoulders in terms of its place in the DC animated movie universe Warner Bros has been building up over the past few years. It’s the first real take on the supernatural underbelly of DC comics, so it has to act as a bridge between the “normal” DC universe populated by the Justice League, introduce us to the concept of how magic and demons exist in this world, and then bring in the disparate members of the main team—Constantine, magician Zatanna, floating spirit Deadman, the demonic Etrigan, and Swamp Thing—and give them a reason to come together and fighting the good fight. The compact nature of these animated films means a lot of the component parts of the film end up suffering, compacted by the need to cram everything in and to do so at a brisk pace. Dark rarely lets up from its incredibly grim opening—in which demonic incursions cause random civilians to hallucinate demons around them, causing untold, bloody destruction—right to the the final moment. That would be fine if it didn’t feel like it had skipped and skimmed its way over a lot of had what had gone on by the time the credits roll. Part of the movie’s problem is that the film decided to frame the story through the lens of the Justice League. The movie opens with the League realizing that the situation they’ve found themselves in is not something they’re equipped to handle, so they bow out of the way soon enough when Batman suggests Constantine is the man they need. But they’re in long enough—and show up in the final fight during the climax of the movie—that they feel like an unwelcome intrusion, added out of a feeling that people wouldn’t get Justice League Dark if characters like Superman, Wonder Woman, and Green Lantern didn’t show up at some point. That also means Batman is not only responsible for bringing Constantine and his ragtag group together, but stays with them throughout the entirety of the movie, acting as the audience surrogate. One of the biggest fears I had going into Justice League Dark would be that it would secretly end up being a Batman and his Magical Friends film, and thankfully that’s not the case—aside from being the introductory factor of the team coming together, Batman doesn’t really do much aside from tag around and ask questions every once in a while. That’s fine, but it also almost worse than him hogging the limelight in a way, because it makes him feel like a totally unnecessary addition to the movie, just so they could put Batman on the front cover. Hey, we’ll watch Batman do anything, right? The other problem—and by far the bigger of the two—is that Justice League Dark’s story is just far too messy to make it feel like anything really happens by the time you’re done with it. The movie does an awkward job of leading you to believe at first that the primary villain of the piece is the evil sorcerer Felix Faust, and he’s built up for the first half of the movie as such—but he’s then almost immediately dispatched and pushed out of the way in favor of a barely-twisty twist to reveal the “real” villain behind all the demonic shenanigans. The result is that neither villain has much of an impact. The time given over to these two elements is stolen away from the actual Justice League Dark. Pretty much every member of the team aside from Constantine suffers from a distinct lack of time to breathe and develop. Zatanna and Deadman both get ardent attempts at character development (especially Deadman, as the comedic heart of the film), but poor Etrigan and Swamp Thing are criminally wasted; in fact, Swamp Thing himself is barely in the film. They might be in the title role but Justice League Dark feels like it has no time at all just to be explore who the team actually are. 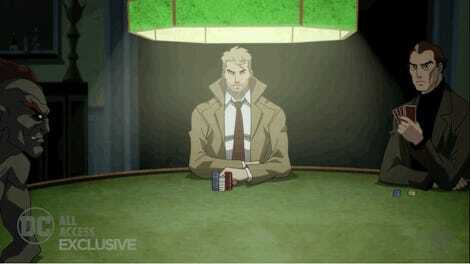 The one character who does not suffer in this regard is Matt Ryan as John Constantine, reprising the role after his own ongoing TV show was canceled in 2015. Ryan clearly relishes playing this character, and the writers equally relish giving him the bulk of the script’s material, acting as essentially the lead character of the film from the moment he’s introduced. He gets to crack great jokes, has some brilliant moments of banter with both Zatanna and Batman, gets to play the big hero, and frequently curse in that delightful Welsh accent of his, run through a suitably Constantine-ian filter. You’ve not lived until you’ve heard Matt Ryan angrily call a demon a wanker in a DC animated movie. For all that Dark succeeds in establishing the grim tone of the supernatural world in the comics, Ryan’s Constantine is a bright, fun light amongst all of it, and the one element of the film that feels like a real success, even if chances for the rest of the team to shine were sacrificed to make him a success. Maybe a future Justice League Dark sequel could improve on all of these things—a clearer story and better-established villain to fight, and no longer needing Batman and the main Justice League to help introduce the team now that these supernatural heroes are introduced to the world—and make for a much better movie. (Or at least, one that makes a much better use of its run time.) But honestly, if anything else, a sequel would be worth it to get more of Matt Ryan as DC’s premiere occult investigator. 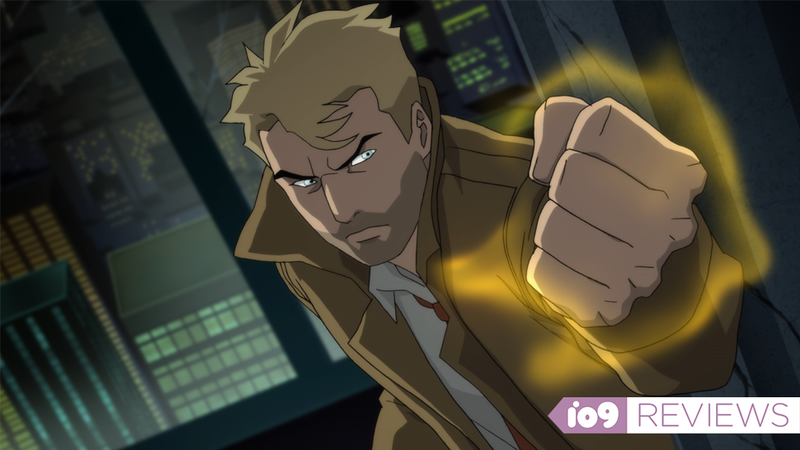 Just as I will for his CW animated series, I’ll be happy to return to the world of Justice League Dark simply to hear John Constantine curse his way through it.